When I need a little something on the go I love these little energy bites for a quick snack. I posted these on Bliss a while back and since I’ve made them several times and they never last for very long. They are essentially my version of a homemade Lara bar, just a lot more economical and they couldn’t be easier to make. You do need a food processor for this recipe, you could chop everything by hand but that would be a lot of work. 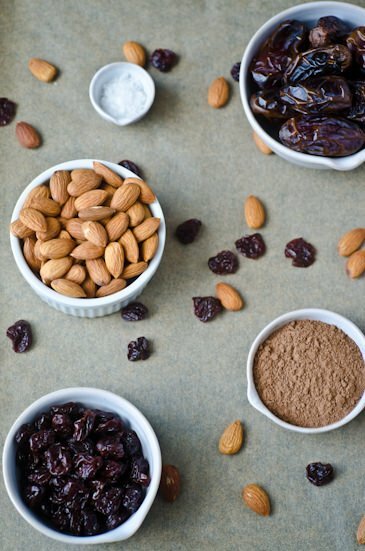 The variations for these are pretty endless, you could add some shredded coconut or replace the almonds with cashews or pecans. The only thing that you can’t substitute are the dates, they are what holds the mixture together and gives the bites their sweetness. You could also press the mixture into an 8×8 pan and pop them in the refrigerator for an hour and then cut them into bars. In a food processor, process the almonds until finely chopped but don’t let it turn to almond butter, you still want some texture. 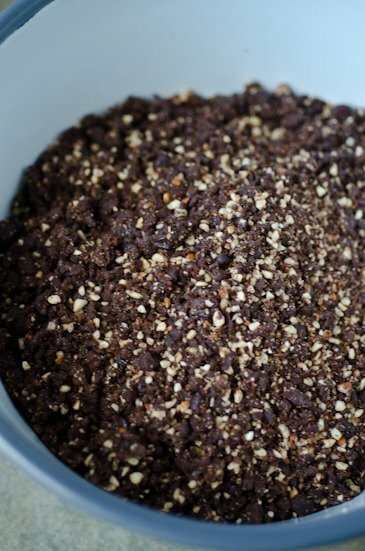 Add the pitted dates, cocoa and salt and process until the mixture is finely chopped and sticks together when you squeeze it between your fingers. Add cherries and process again until well combined. Using a tablespoon at a time roll the mixture into one-inch balls. Store in the refrigerator for up to 4 days or freeze for up to 3 months. Let them defrost for 20-30 minutes before serving if frozen. These look yummy! I think my son would love these! I love the pictures on blog, I’m so glad I found your blog! I’m so glad you are enjoying the blog. When I hear that people are finding it useful and pleasurable it makes it all worthwhile. 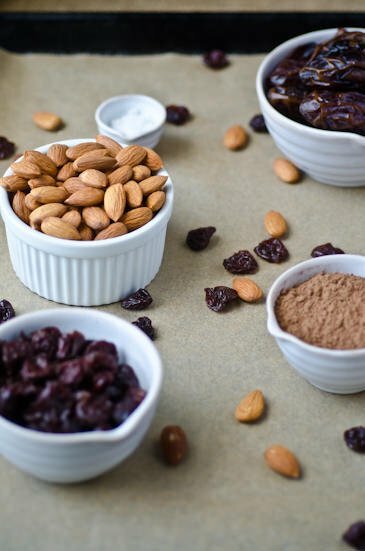 We also make a version of these bites without the cherries and we replace half the almonds with walnuts and they taste just like brownies! Hope you enjoy them if you try them. I love these energy bites, Tina. The chocolate and cherry flavors go great together. I’ve made something very similar from Cooking Light actually. But haven’t made them in a while, so thanks for the reminder. I love them because they’re a great snack to pack for work or school too! My mistake – I just realized I was in fact making your recipe all of this time. 😉 So good! 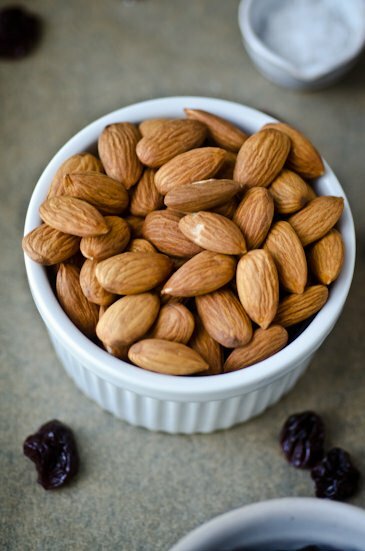 Can you substitute peanuts or sunflower seeds or pumpkin seeds for the almonds? I’m allergic to tree nuts. Thanks! You can definitely substitute a different nut for the almonds, pumpkin seeds would also be a good option. Let me know how they turn out if you try them! Made these with pumpkin seeds and they turned out great. My mixture was a little dry but I think it was because the dates weren’t as soft as they could be. Thanks for the great recipe! I’m glad they worked out with the pumpkin seeds. Fresh dates do make for a better texture, you could always soak your dates in hot water for 20 minutes beforehand and that should take care of the problem. If I follow the recipe, is there a rough idea of how many calories are in these? Each bite has roughly 90 calories. Hope that helps! Love this recipe, it is a lifesaver in the mornings before work and before going to the gym. Do you have additional nutritional information such as fat content, carbs, sugar, protein, etc? I’m not a huge calorie counter but each serving contains about 18 grams of carbs, 4 grams of fat, 2 grams of protein and 13 grams of sugar. Hope that helps! Very simple, clean and tasty. I was looking for a treat to take on hiking trips. These will be perfect. Packing them to go with me tomorrow. Thanks! 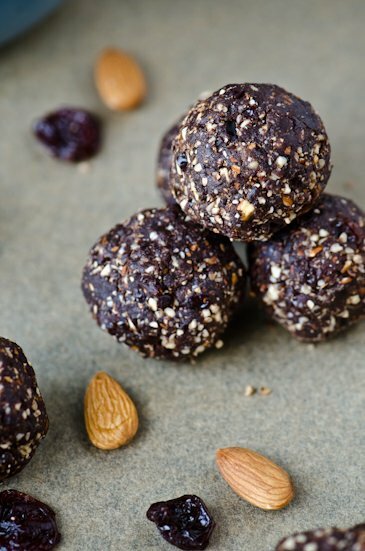 I hope you like them, they are the perfect snack for replenishing after a hard hike! Can I substitute Cacao powder for the cocoa? You can definitely substitute cacao powder for the cocoa. If they aren’t sweet enough for you just add one or two more dates. I hope you like them! What kind of cocoa do you use? It looks like cocoa powder in the picture. Is it a dark chocolate cocoa powder? I used a regular cocoa powder for the energy bites but you could also use raw cocoa if you prefer. I think dark chocolate cocoa powder might be a bit too strong for the bites, or you could try half regular and half dark if you want to experiment. I hope you enjoy them if you try them! By the way, I can’ t figure how 10 dates equals 2 cups. I used 1 cup and it was about 15 dates. The recipe is meant to be two cups of while dates loosely packed. That should equal about two cups, if you pit and chop them it will probably equal about one cup in total. If the mixture isn’t sticky enough add one or two more until the texture is right. Hope that makes sense and I’m glad you enjoyed them! Sorry to hear they didn’t turn out well for you. Most likely your dates were a little bit dry. Next time soak the dates in hot water for 15 minutes and drain before adding them to the food processor. Hope that helps! I make something similar but these look if anything even more dark and chocolately, mmm! The chocolate/cherry combination is one of my favorites. It’s hard to get my son excited about eating a snack that doesn’t come from a factory so I had to make them full of chocolate flavor! I hope you like them if you try them! I made these and subbed sunflower seeds for the nuts. they turned out great. I’m so glad you liked them! Sunflower seeds are a great substitution. Thanks for trying the recipe!